Posted on April 21st, 2018 in At large. Masses of grey cloud off to the south when I checked conditions around 0630 but the forecast south wind hadn’t yet arrived and the ocean was looking smooth and clean. It won’t last though because the forecast is calling for 10-15 kts of s-se later. Swell at 0500 was coming from the SSE at 13 seconds apart but only a metre out at sea. As the pictures show, it’s not making much of an impression on our beaches. Sets at magnet spots were struggling to get above the knee high mark. And they were pretty few and far between. Tide was low at 0625 and is now heading to a 1.37 m high at 1235. We should see a high around 24° and water has cooled to 20°. The MHL’s modelling is projecting surf conditions to bump along at about the current intensity for at least another 2-3 days. But thereafter the models are starting to look rather interesting, particularly as we get toward Thursday-Friday. The swell looks interesting I should say, because the current projections indicate a feisty ECL in close to the coast (ie blasting wind and showery skies). Have yourself a top old Saturday one and all! Forecast issued at 4:10 am EST on Saturday 21 April 2018. A high pressure system near Tasmania extends a ridge into southeast New South Wales, while a trough lies just off the northern coast. This pattern is bringing southeast to northeasterly winds to most coastal areas, with little change expected through the next few days. South to southeasterly 10 to 15 knots, reaching 20 knots offshore during the morning. Southeasterly about 10 knots becoming east to northeasterly in the evening. Westerly about 10 knots becoming northeasterly around midday. Posted on April 20th, 2018 in Dee Why. Sunny skies and light SW breeze at 0715 when I climbed aloft to the RealSurf crows nest to grab a few snaps for your good self. As you can see, it’s down noticeably from this time yesterday. I’d call the point knee high and the beach knee to maybe waist and a bit. And the Bureau says it should drop a little more too. As of 0600 the MHL buoy was detecting a metre from 165° (SSE) at 13.8 sec. Tide was coming in from the 0530 low as it heads to a 1.4 m high at 1135. Should be a partly cloudy day with a high of 25 and wind should go to the north at 10-15 kts. Water is getting cooler now and is currently around the 20° mark. And the outlook? 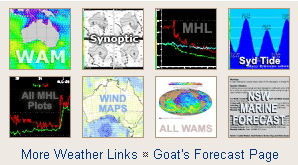 Well it’s Friday morning, so we have a piping hot fresh forecast from the Goat to answer your every question. A slow-moving high pressure system over the Tasman Sea extends a ridge towards the New South Wales north coast, while a weak southerly change is expected to reach the far north coast early tomorrow. Winds will slowly turn southeast to northeasterly along New South Wales waters over the next couple of days as the high lingers in the region, while a low pressure trough is expected to develop off the northern coast and deepen over the weekend. Northerly 10 to 15 knots shifting southerly early in the morning. Southerly about 10 knots increasing to 10 to 15 knots early in the morning. Partly cloudy. The chance of a thunderstorm offshore in the early morning. Southeasterly 10 to 15 knots. Partly cloudy. The chance of a thunderstorm in the evening. Posted on April 19th, 2018 in Goat's Forecast. You know how the Bureau has been issuing those powerful surf warnings…and you might or mightn’t have seen much powerful surf? So you’ve wondered what the hey are they talkin’ about?? Today for example you would have seen the swell fading in the arvo, but, at places that were open to dead South swell, there were sets bigger than the average wave conditions from time to time. But if you were somewhere protected from dead South swell, it would have been closer to a lake. Thursday: similar but more East in it, and with 9-10 sec peak sets from the East. Remember the Diggers on Anzac Day. Posted on April 19th, 2018 in Dee Why. Waist to chest with the odd plus at Dee Why this morning when I checked for the first time a little before 0700. As of 0730 wind was light from the NW. It should come around to the north at 10-15 kts later. Tide is coming in to a 1.5 m high at 1040. The MHL buoy was showing 1.4 m of 11 sec SSE swell. The models show the swell fading across the day, but interestingly the Bureau is warning about deceptively powerful conditions again tomorrow morning. Get in ASAP looks to be the plan! A high pressure system over the Tasman Sea extends a ridge towards the north coast. This high will remain in the region for the remainder of the week, with a passing trough forecast to bring a brief southerly chance to southern and central parts of the coast later today and tomorrow. Northerly 10 to 15 knots. Partly cloudy. 70% chance of showers. The chance of a thunderstorm late this afternoon and evening. Northerly 10 to 15 knots turning westerly in the morning then south to southeasterly 10 to 15 knots in the late morning.Winds reaching up to 20 knots inshore in the early afternoon. Around 1 metre, increasing to 1 to 1.5 metres inshore around midday. Partly cloudy. 80% chance of showers. The chance of a thunderstorm in the afternoon and evening. Surf conditions in the early morning may be more powerful than they appear and are expected to be hazardous for coastal activities such as crossing bars by boat and rock fishing. Southeasterly 10 to 15 knots tending east to southeasterly about 10 knots during the morning. Posted on April 18th, 2018 in Dee Why. Had a look at Curly and Dee Why this morning. Unfortunately the steady ESE wind (6-9 kts) was making the swell look pretty ordinary. There were no takers that I saw at Curly a little before 0800 and around at Dee Why numbers were way down on yesterday. The point was less consistent and noticeably smaller despite the MHL buoy showing only a slight change since yesterday. It was still 2.4 metres at close to 12 sec from the SSE, so I was mildly surprised to see wave faces in the waist to shoulder plus range as opposed to shoulder to a bit overhead range of yesterday. The Bureau also has a warning that surf conditions may be more powerful than they appear, so who knows, maybe I rocked up in the middle of a lull. Next tide is a 1.6m high at 0950. It’ll be back to low at 1545. Wind should go around to the NE in the afternoon, so maybe that’ll dial up prospects in the north corners that most definitely weren’t evident this morning. Have a great Wednesday one and all! A high pressure system near Tasmania is expected to move over the Tasman Sea today and extend a ridge along the New South Wales coast, turning winds east to northeasterly. This high will then remain in the region for the remainder of the week with a passing trough forecast to bring a brief southerly change to southern and central parts of the coast on Thursday and Friday. Southeasterly 10 to 15 knots becoming northeasterly in the afternoon. Northerly 10 to 15 knots tending south to southeast 10 to 15 knots during the morning. Posted on April 17th, 2018 in At large. Hardly anyone in the water at south Curly, but it looked like a fair amount of work for slow and sloppy overhead wave faces. 20+ in the water at the point and a few scattered up the beach from there at Dee Why. Again, choppy, lumpy and ponderous is how I’d describe it. Swell is set to build to 3 metres out at sea and the wind should be 15-25 kts from the S-SW. So not utterly hopeless if you’re keen. Tomorrow the wind is supposed to be more SE-NE across the day, but not blowing as hard as the forecast for today. Swell ought to stick around too and then it declines on Thursday while wind goes north. Right now from Friday onward into the front half of next week looks like being really small to flat on most of the models. Have yourself a grand Tuesday one and all! Posted on April 16th, 2018 in Dee Why. Sunny skies, light NW breeze – and less than half a metre of 12-sec SE swell. Couldn’t see any sign of a wave at the Dee Why end of the beach and given that, I’d be surprised if there was a wave anywhere else this morning. So the obvious question is; when will we see an improvement? And the answer is: not long. The Bureau says the swell should ramp up tomorrow morning. Unfortunately it’s looking like the wind will go from the SW to southerly as the swell ramps. So, maybe there’ll be a little window of opportunity, but then again, maybe not. Wednesday looks a little more hopeful, particularly in the afternoon when the wind is set to swing from the SE to the NE as the swell pushes along at 2-2.5 metres from the south. The models predict northerly wind on Thursday as the south swell fades toward the metre mark by Friday morning. Beyond that, the long range consensus is not too fabulous. If they’re right, the second week of NSW school holidays could be marginal to near flat. But I wouldn’t be locking in plans on that basis, because those long range predictions are highly speculative. Have yourself a top old Monday everyone! A low pressure system to the far southeast of Tasmania is moving slowly east directing westerly winds across the western Tasman Sea. Winds along the New South coast will tend southwest to southeasterly during Tuesday as a high pressure system moves near Tasmania extending a ridge to the north. West to northwesterly 10 to 15 knots tending west to southwesterly 15 to 20 knots in the evening. Winds reaching up to 25 knots offshore in the evening. 1 to 1.5 metres, decreasing to 1 metre around midday, then increasing to 1.5 to 2 metres later in the evening. Southwesterly 15 to 20 knots, reaching up to 25 knots offshore early in the morning. Winds turning southeasterly during the morning. Around 1 metre, increasing to 1 to 2 metres offshore. Southeasterly 10 to 15 knots turning northeasterly 15 to 20 knots during the afternoon. Posted on April 15th, 2018 in Dee Why. What a stunning morning. Clear skies, mild temp and a steady offshore perfectly grooming the sea surface. Alas, as the pictures reveal, there is no surf at Dee Why. MHL must be having technical difficulties because the only buoy reporting in this morning was Batemans Bay. For what it’s worth, it was showing less than a metre of 9 second SSE. So the flatness is obviously pretty widespread. Not that it has any bearing on our prospects, but the tide was 1.7 m at 0740 and is currently dropping to the 0.37 m low at 1350. Should be mostly sunny today, with a high of 25°. The models are showing a slight upward bump around lunchtime today, but it’s not looking likely to be much above the knee high mark. A low pressure system southeast of Tasmania is moving slowly east directing westerly winds across the western Tasman Sea .Winds along the New South coast will tend southwest to southeasterly during Tuesday as a high pressure system moves near Tasmania extending a ridge to the north. Westerly 15 to 25 knots, reaching up to 30 knots in the late morning and afternoon. Southeasterly below 1 metre, tending southerly 1 to 1.5 metres around midday. Westerly 15 to 25 knots tending northwesterly 10 to 15 knots in the morning then turning west to southwesterly 15 to 25 knots in the late morning and afternoon. 1 to 2 metres increasing to 1.5 to 2.5 metres later in the evening. Southerly around 1 metre inshore, increasing to 1 to 1.5 metres offshore during the morning. Southwesterly 15 to 20 knots turning southeasterly 15 to 25 knots during the morning. Posted on April 14th, 2018 in At large. At daybreak, as the tide was approaching the 1.6 m high at 0700 and the wind was coming steadily from the NW at 8-10 kts, the ocean was smooth inshore. Smooth and just about perfectly flat between the tiny sets. Out at sea there was a sub-metre sized NE bump. Skies were overcast and the temperature was an alarming for mid-April 24°. We’re set to reach 31° as the skies clear later. Along the beaches conditions were very clean and wave faces on the sets were in the knee to thigh high range. There were a fair number of folk in the water up around North Narrabeen but it was unsurfably flat south of there. Around the corner at the Longy to Dee Why stretch, there were equally tiny conditions and the people in the water were clustered in a zone from roughly No Mans to a little north of the lagoon. Tomorrow’s likely to be even smaller and right now it looks as though the energy won’t be coming back until midweek according to most, but not all, of the swell models. So maybe take the mal for a micro wave this morning and then keep an eye on it, but know that you’re not going to miss anything spectacular. Have a top old Saturday and stay in touch, because flat or not, I’ll be checking it out for you every morning. Northwesterly winds along the New South Wales coast will turn vigorous westerly later Saturday and early Sunday in a wake of cold front with an associated low to the south moving east across the southern Tasman Sea. Winds will tend southwest to southeasterly during Tuesday as a high pressure system moves over the southern Tasman Sea extending a ridge along the coast. West to northwesterly 15 to 20 knots reaching up to 30 knots offshore. 60% chance of showers early this morning. A thunderstorm likely early this morning. Sunny afternoon. Westerly 15 to 25 knots, reaching up to 30 knots offshore. Westerly 15 to 20 knots tending north to northwesterly 10 to 15 knots during the morning then tending west to southwesterly 15 to 20 knots during the evening. Posted on April 13th, 2018 in Dee Why. Heavy smoke haze this morning so picture quality not the best, but you should be able to see that there were interesting sets turning up at Dee Why at around 0700 this morning. The MHL Sydney buoy isn’t reporting in at the moment, but down the coast at Pt Kembla it was SSE, 1.4 m at 14 seconds. Looking at the Dee Why end of the beach and the point, I’d be calling it waist with chest plusses from time to time. Tide was a 1.6 m high at 0615 and we’re currently headed to the 0.45 m low at 1245. Outlook you ask? Check the Goat’s thoughts! Northwesterly 15 to 20 knots turning northerly in the middle of the day. Winds reaching up to 30 knots in the late evening. 1 to 2 metres, increasing to 1.5 to 2.5 metres by early evening. Southeasterly 1 to 1.5 metres, tending southerly around 1 metre by early evening. Sunny morning. The chance of a thunderstorm during this afternoon and evening. North to northwesterly 20 to 30 knots becoming northwesterly 20 to 25 knots in the middle of the day then increasing to 25 to 30 knots in the late afternoon. Partly cloudy. The chance of a thunderstorm in the morning. West to northwesterly 20 to 30 knots. 2 to 3 metres, decreasing to 1 to 1.5 metres during the afternoon or evening.